Greyhound Rescue between July 2004 and the 5th December 2009.
of the Retired Greyhound Trust for whom we are now fostering. Yesterday we received a call from another rescue centre saying they had a dog brought in that they thought was a Greyhound and could we take a look and possibly take her because of the number of dogs in their care. 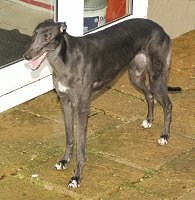 Daisy came bouncing out the kennel to meet me and because she was indeed a Greyhound she came home with me in the car. She happily jumped in the back with our other Greyhounds and put Max and Sandy firmly in their place when they tried to sniff her - she was having none of it. Indi and Bobby accepted her immediately and within a couple of minutes of leaving the centre all the Greyhounds were laying in the back of the car quite content. I called in at the Post Office on the way home and when I came out found her laying curled up on the driver's seat, which was rather nice as she'd kept the seat warm for me. Rather than going home and coming back out again I decided to walk them from the car as it was easier with the five. She walked lovely on the lead up the back road with Max and Sandy walking either side of her. 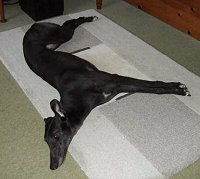 Daisy is an ex-racing Greyhound who only stopped racing a couple of months ago. Some of her hair is a bit on the thin side especially round her back legs and the hair on her nose is worn down where she's been wearing a muzzle. She's very much like Indi and when all her hair grows back as it will do once on a good diet with a cod liver oil supplement it will be difficult to tell the two of them apart. When we call her name she doesn't seem to repond, which may be nerves or it could be she doesn't know her name. When we got her home we walked her round the garden then fed them all. Daisy has a good appetite and went in the garden after with the others for a while. Stairs are no problem and neither are wooden floors. In the afternoon she very quickly settled on a bed in my office and from what we've seen of her so far she's a very sweet little girl. After tea we bathed her as her skin was flaking a bit and she smelt of kennels. She wasn't too sure of her bath and towards the end sat down and refused to stand up again but once lifted out and dried off she shook herself and did a little dance around the bathroom. Shortly after her bath she had an accident by the kitchen door, which may have been because of the bath or the fact Max was told off for cocking his leg on the toy box when he realised I was bathing her - Max has really bonded with me and can get a little jealous of a new dog coming in and the attention I give it until things settle down. Last night Daisy slept on one of the beds on the landing and we never heard from her during the night. It was very cold so we covered her with a blanket, which, from the look on her face she loved having wrapped around her. This morning because we never heard her wake up she did a wee. We only just missed it so took her out immediately. 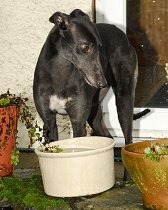 Daisy isn't fussy over food and is getting on well with the other Greyhounds. This morning we missed Daisy again because she did a wee the moment she woke up and because she was on the landing again we never heard her. This afternoon we took her to the vet for a check up and her first inoculation as she came with no card. She weighed in at 55lbs (24.75k). The vet said she was in a good condition and although her teeth looked dirty there was no gum disease nor receeding gums so it was decided to leave things till her next inoculation in two weeks time to see if eating bones and chews would clean them. If not she may need to have them cleaned by the vet. Last night Daisy slept in our bedroom so when she stirred in the morning we heard her and took her out. She's quite good during the day now because she goes to the toilet the moment she's let outside but she's still not quite there yet. Daisy came with us for a trip to my Mum's house, she enjoyed the ride in the car and wasn't bothered in the slightest at being in another house - she just followed the others. Daisy must have been pulled by the collar in the past because she doesn't like you holding it to lead her anywhere such as out to the garden. The moment you hold her collar to lead her she yelps, however, if you still keep hold of it but stop moving her forward and talk to her gently she will in general, then follow. If you hold the loose end of her collar instead she thinks she's on a lead and will walk with you no problem. Daisy is a really happy little girl and her coat is becoming shinier by the day and no longer shedding loose skin as she did when she arrived. 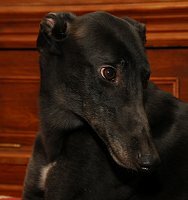 This afternoon the couple who own Red called in to see Daisy with a view to adopting her as a companion for him since their elderly Greyhound Bessie passed away a few weeks ago. 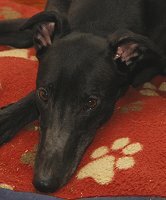 They thought Daisy lovely and intend re-homing her when the get back from being away over Christmas. They would like to re-name her Izzy so from now on we shall also call her that to help her get used to it for when she goes to her new home. Izzy went for a ride on a car ramp in a garage this lunch time. We were driving into town to do a bit of shopping when the exhaust went so whilst I did the shopping Stuart took the car to the garage to see how serious it was - what a thing to happen on Christmas eve! 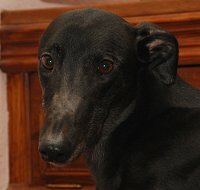 The mechanic who said he loved dogs climbed in the car with all five Greyhounds to drive it onto the ramp and met Izzy sitting on the passenger seat when he climbed in. Of course Izzy being Izzy gave him a wonderful greeting before sitting on the passenger seat for the journey. Izzy's come out of her shell - she's started playing with the others, found the toybox - loves the fluffy ball, which she chases everywhere and found the comfort of both the settee and our bed! Father Christmas arrived last night and left Izzy a soft squeaky toy and a huge dinosaur bone, which Indi helped her unwrap as she didn't know how to take the wrapping paper off. When she realised it was a bone, well, that was that - she found it wonderful as did all the others with their bones - we had a very happy crunchy Christmas day! The bone worked wonders because Izzy's teeth are lovely and clean today from chewing it all day yesterday and a dental trip to the vet seems unlikely now. As we were setting off for our walk this afternoon we could hear the clay pigeon shooting in the distance - Izzy wasn't too sure of this at all and became a bit jumpy but thankfully we never heard much more shooting and after a while she settled. This evening there was gunfire on the television and she stared around her then got up and walked upstairs to her bed. From the way she reacted her new owners will need to watch when there's thunder or fireworks to see if these unsettle her as they may because of the way she reacted to the gunfire. This morning Red's owners called to collect Izzy and gave them a wonderful welcome. After all the paperwork was complete she happily walked out to their car with them but was a little reluctant to jump in at first. The back of the car was a bit higher than ours but once she mastered it she simply lay in the back for the journey home. We only had Izzy a short while but we shall miss her as she was a real cutie, however, we wish her a long and happy life with her new family and no doubt we shall be seeing her and Red in the future. of fun for them as she settles down. One picture of her with her legs in the air was an uncanny reminder of their Flash, Bessie's brother. Received an email this evening letting us know that with it being New Year's Eve last night fireworks could be heard close to home. They say Izzy was a good little girl, she jumped and got a bit frightened but that they feel this was probably due to Red as he doesn't like them. After a while she settled once the television was turned on but Red took ages to settle. 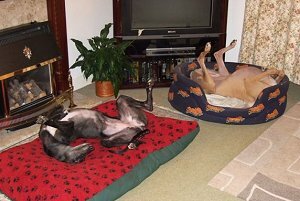 He was still panting a great draught down his owner's neck where he went to bed on the emergency bed in the lounge as they were encouraging Izzy to sleep downstairs with Red. Izzy likes tomato and vegetable juice and will come straight away if called for and tonight her owners are trying her with sardines tea time. We called in this morning to do Izzy's follow up visit and were greeted by two very happy dogs. 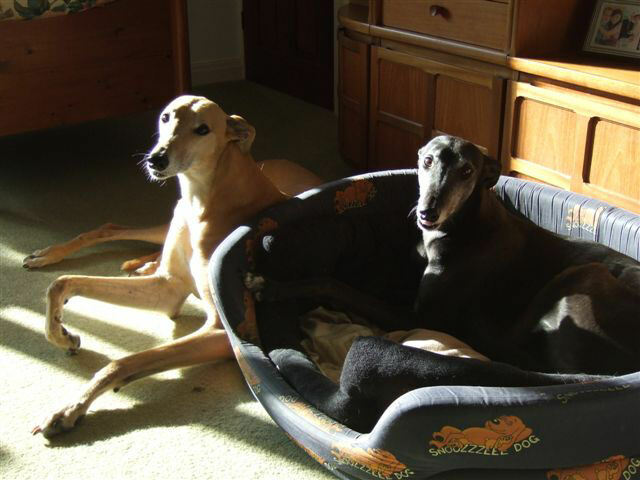 Izzy and Red seem to be getting on well together and it's lovely to see her happy and relaxed in her new home. Received an email letting us know that Izzy's coat has been improving and her owners think the bare bits on the back of her legs are just starting to grow fine fur. They are also now giving her short runs off the lead and so far she's been very good. Received an email from Izzy's owner this evening letting us know she has been with them one year and is an absolute sweetie. We received a Christmas card today letting us know that both Red and Izzy are fine. We received a Christmas card today letting us know that Izzy is fine. We received a Christmas card today letting us know that Izzy is keeping well despite her being a bit older. We received a Christmas card today letting us know that Izzy is doing okay now she's on the YuMove for her joints, but she not walking as far as she used to do.